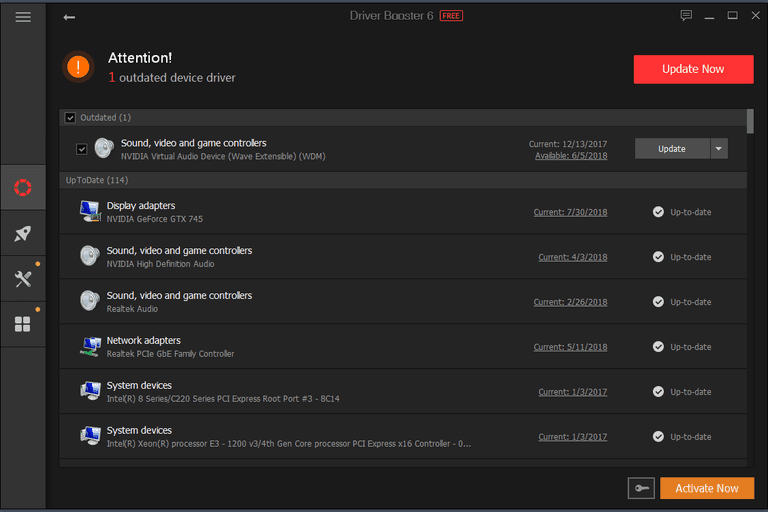 This review is of Driver Booster version 6.4.0. Please let me know if there's a newer version I need to review. If you're looking for an easy to use driver updater, Driver Booster is likely your best bet. In our testing, we didn't have any issues with downloads, and installs have never caused problems like BSOD errors or bricked hardware. The updates found in Driver Booster aren't launched in a web browser, so you don't have to download these drivers manually like you might have to with other driver updater tools. That's far too much of a hassle that might even deter some from updating their drivers, and it can sometimes lead to clicking the incorrect download link. Above, we mentioned that Driver Booster is unable to scan correctly unless an active internet connection is established (some driver updaters don't need a network connection to scan). It will look like it's working, but without a network connection, it will simply scan without using any factual update information, which unfortunately results in displaying an incorrect set of updates (or none at all). Because there's also a professional version of Driver Booster, some features are limited in the free version. For example, more driver updates are found in the professional program and features like automatically downloading and backing up drivers, and automatic program updates, are not options in the free edition.